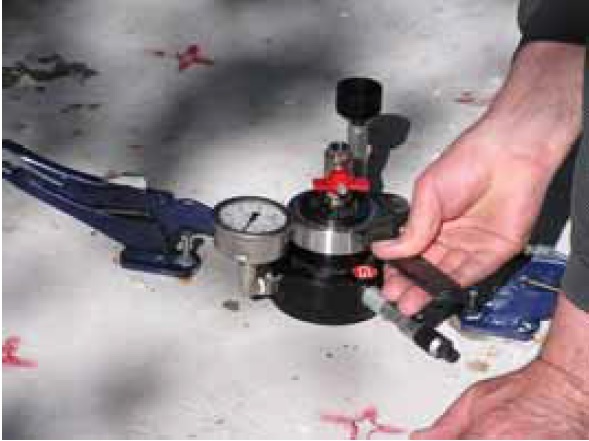 The GWT measures the permeation of water into the test surface under an applied pressure. 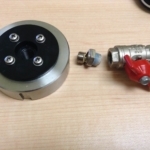 A pressure chamber containing a watertight gasket is secured tightly to the surface by two anchored clamping pliers or by means of a suction plate. Alternatively, the gasket may be bonded to the surface with an adhesive. The chamber is filled with water and the water is allowed to be absorbed by the test surface for 10 minutes. 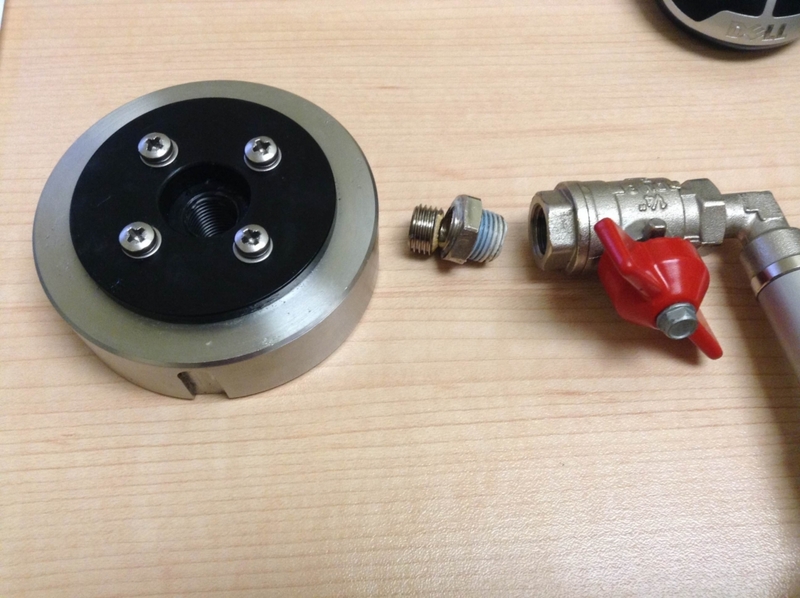 The filling valve is closed, and the top cap of the chamber is turned until a desired water pressure is displayed on the gauge. 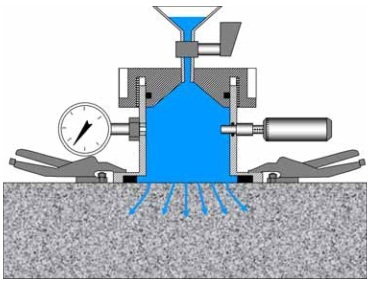 As water permeates into the concrete, the selected pressure is maintained by means of a micrometer gauge pushing a piston into the chamber. The piston movement compensates for the volume of water penetrating into the material. 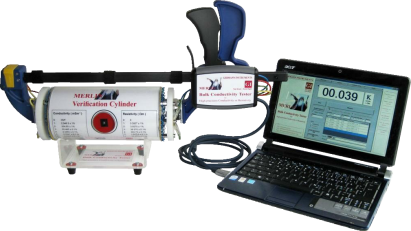 The travel of the piston as a function time is recorded and the speed the piston travel in µm/s is used to characterize the permeation of the test surface. On the left, the cap of the GWT is being tightened to bring the water pressure to 100 kPa. On the right the GWT is being used on a vertical concrete surface. An elbow is used to permit initial filling of the chamber. 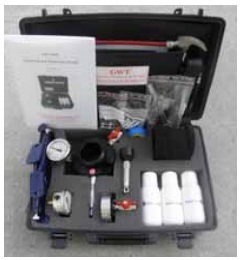 The micrometer is turned to advance the piston and maintain the water pressure at 100 kPa. 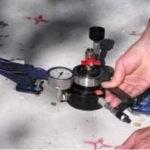 The micrometer position is recorded as a function of time. 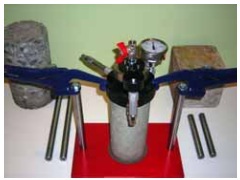 Testing is usually conducted for 10 minutes, but longer times and a higher pressure (500 kPa) may be required for low w/cm concrete. 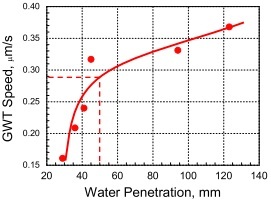 Correlations can be established between the speed of piston travel and the depth of water penetration measured on companion specimens using EN 12390-8 “Testing Hardened Concrete-Part 8: Depth of Penetration of Water Under Pressure.” The graph on the right is an example of such a correlation. 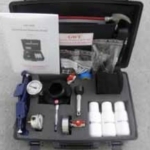 Project specifications may require that the concrete meet a maximum water penetration using the 72-h EN 12390-8 test. For example, a maximum depth of 50 mm is specified typically for concrete in non-corrosive conditions. 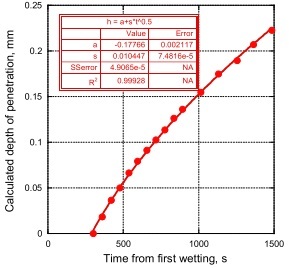 Using the established correlation, the GWT can be used for in-place testing to demonstrate that the concrete in the structure conforms to the water penetration requirements. 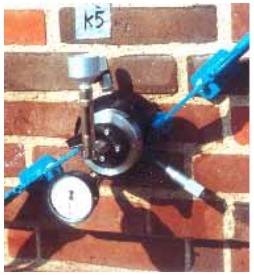 The GWT is shown being used for testing the water tightness of a brick masonry wall. It was found that when it rained and for a normal wind pressure, water penetrated the wall. The first thought was that there was a problem with the mortar joints. By using the GWT, however, the problem was shown to be the related to the brick units, not to the mortar joints. The brick units had been burned at a higher temperature than normal to produce the required color, but the higher burning temperature increased the permeability of the brick. Mohammadi, B and Nokken, M.R., “Influence of Moisture Content on Water Absorption in Concrete,” 3rd Specialty Conference on Material Engineering & Applied Mechanics, Montreal, May 29-June 1, 2013.